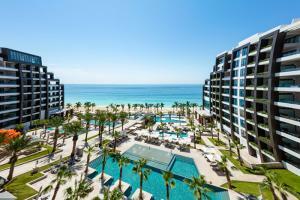 The all-inclusive, oceanfront Garza Blanca Resort & Spa Los Cabos imparts a modern yet timeless vibe. Multiple outdoor terraces with fire pits, lounges and Jacuzzis are great respites to lay your sunhat and shades during the day and dance the night away with music and entertainment. Relax by a different pool everyday with eight options including the rooftop’s infinity with daybeds, incredible ocean and beach views and swim up bar. The spa doesn’t disappoint with a hydrotherapy circuit, a 10-station vitality pool, ice-cold dipping pool, and steam and sauna. A fitness area and tennis court are also on site. Your taste buds are fully serviced with delectable culinary experiences from fine dining to a gourmet deli. Suites, lofts and penthouses offer al-fresco living with expansive, furnished balconies and terraces with oversized hammocks overlooking the Pacific horizons or resort landscapes. It’s a family affair with a custom-built family zone and a host of kids' activities.